The strong, flapping flight of bats offers great possibilities for the design of small aircraft, among other applications. By building a robotic bat wing, Brown researchers have uncovered flight secrets of real bats: the function of ligaments, the elasticity of skin, the structural support of musculature, skeletal flexibility, upstroke, downstroke. 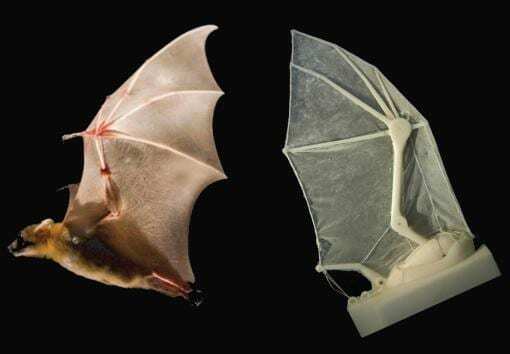 Researchers at Brown University have developed a robotic bat wing that is providing valuable new information about dynamics of flapping flight in real bats. The robot, which mimics the wing shape and motion of the lesser dog-faced fruit bat, is designed to flap while attached to a force transducer in a wind tunnel. As the lifelike wing flaps, the force transducer records the aerodynamic forces generated by the moving wing. By measuring the power output of the three servo motors that control the robot’s seven movable joints, researchers can evaluate the energy required to execute wing movements. Testing showed the robot can match the basic flight parameters of bats, producing enough thrust to overcome drag and enough lift to carry the weight of the model species. A paper describing the robot and presenting results from preliminary experiments is published in the journal Bioinspiration and Biomimetics. The work was done in labs of Brown professors Kenneth Breuer and Sharon Swartz, who are the senior authors on the paper. Breuer, an engineer, and Swartz, a biologist, have studied bat flight and anatomy for years. The faux flapper generates data that could never be collected directly from live animals, said Joseph Bahlman, a graduate student at Brown who led the project. Bats can’t fly when connected to instruments that record aerodynamic forces directly, so that isn’t an option — and bats don’t take requests. But the model does exactly what the researchers want it to do. They can control each of its movement capabilities — kinematic parameters — individually. That way they can adjust one parameter while keeping the rest constant to isolate the effects. Detailed experimental results from the robot will be described in future research papers, but this first paper includes some preliminary results from a few case studies. March 29, 2018 - Bats Take Flight Science FridayThanks to high-speed video, we now know that bats fly very differently compared to birds. March 1, 2013 - Researchers merge disciplines to create robotic bat wing The Brown Daily HeraldThe robotic wing may also be integral for the development of bat-sized camera-carrying aircrafts. May 23, 2014 - Tiny muscles help bats fine-tune flight, stiffen wing skin Phys.OrgBats appear to use a network of hair-thin muscles in their wing skin to control the stiffness and shape of their wings as they fly, according to a new study. February 22, 2013 - Watch a Robot Blackjack Dealer in Action Slate MagazineEvery Friday, Future Tense rounds up the best robot videos of the week. Seen a great robot video? Tweet it to @FutureTenseNow, or email us.